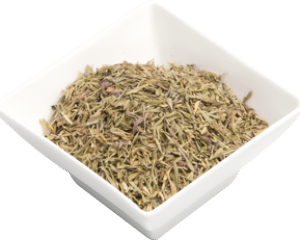 Thyme leaves is a perennial herb from the mint family originally native to the southern Europe and Mediterranean regions, and a great ingredient for daily cooking. Its dried leaves are gray-green leaves, and it has an herbaceous, minty, light-lemon aroma and mint and lemon flavour. It can be added to soups, stews, clam chowder, stuffing, gumbos, heartier sauces, sausages, roast chicken or pork, and many vegetable dishes, or fish. Its mint-like flavour that pairs well in most dishes. Its characteristic astringency counteracts rich and fatty foods. Thyme can be added early on in cooking as it takes time to release its flavour and due to its intense flavour should be added sparingly. However, prolonged cooking can result in the evaporation of its essential oils. Season chicken burgers with thyme and parmesan. It also adds a meaty note to mushroom and lentil burgers. Add to bread making or combine with savory fillings in focaccia. Used with parsley and bay leaves, parsley and celery as the core ingredients of bouquet garni. It can be mixed with other herbs and it characteristic herb flavour to the popular Middle Eastern blend known as zaatar. It can be added to flavour patés and terrines, casseroles, tomato and wine based sauces, spice rubs, stews, marinades, thick vegetable soups, clam chowder, bread stuffing, gumbos, heartier sauces, roast chicken or pork, many vegetable dishes, or fish. It can be combined with garlic to spread over lamb before cooking. With chicken can be sprinkled over it before grilling. Thyme contains principles that have disease preventing and health benefits, offering high levels of quality phyto-nutrients, minerals and vitamins that are essential for optimum health. It contains thymol, one of the important essential oils, which has antiseptic, and anti-fungal characteristics. It can be used in a hot drink to sooth a sore throat, painful cough or bronchitis. It also contains one of the highest antioxidant levels among herbs. Its leaves are one of the richest sources of potassium, iron, calcium, manganese, magnesium, and selenium. It is a source of vitamins as B-complex, vitamin-A, vitamin-K, vitamin-E, vitamin-C, and folic acid. Mediterranean, Southern Europe, Western Asia and North Africa.